of Froissart's Chroniques (c. 1475). 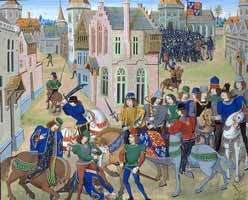 the English Peasants revolt, 1381. A surprise ending is today's prompt from the Poetry School. This doesn't really conform to a surprise, more that it draws up the threads of what has gone before, on the last line. I suppose it might be called a sonnet as it has 14 lines. The first five are shown below. leaving fear behind, from the women at Grunwick.